Deborah H. Atkin, M.D. explains how the ZWave PRO employs acoustic radial wave technology to disrupt fatty tissue for cellulite reduction on the stomach, thighs, and buttocks. 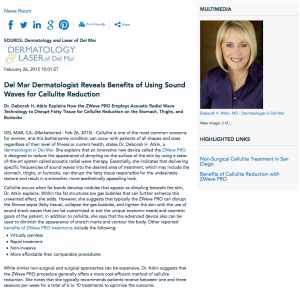 Del Mar, CA—Cellulite is one of the most common concerns for women, and this bothersome condition can occur with patients of all shapes and sizes regardless of their level of fitness or current health, states Deborah H. Atkin, M.D., a dermatologist in Del Mar. She explains that an innovative new device called the ZWave PRO is designed to reduce the appearance of dimpling on the surface of the skin by using a state-of-the-art system called acoustic radial wave therapy. Essentially, she indicates that delivering specific frequencies of sound waves into the desired area of treatment, which may include the stomach, thighs, or buttocks, can disrupt the fatty tissue responsible for the undesirable texture and result in a smoother, more aesthetically appealing look. While similar non-surgical and surgical approaches can be expensive, Dr. Atkin suggests that the ZWave PRO procedure generally offers a more cost-efficient method of cellulite reduction. She notes that she typically recommends patients receive between one and three sessions per week for a total of 6 to 10 treatments to optimize the outcome. Ultimately, Dr. Atkin believes that this revolutionary device is one of the best methods available for minimizing the appearance of cellulite and improving overall skin tone and condition. Due to the gentle nature of the technique, natural-looking results, and speedy procedure time, she says many women can now feel more comfortable wearing whatever they want without feeling self-conscious about skin dimpling. A board-certified dermatologist practicing in Del Mar, Dr. Atkin received her undergraduate degree from the University of California, Santa Barbara and her medical degree from University of California, Los Angeles, where she graduated with honors. She went on to complete specialty dermatology training at the University of Arizona, Tucson, as well as Scripps Clinic and Research Foundation in San Diego. A member of several esteemed medical associations, including the American Academy of Dermatology and the American Society for Dermatologic Surgery, she is also an advocate of charity work, having served as a surgical volunteer for the African Medical Mission, as well as other prestigious causes. She is available for interview upon request.